I followed the ingredients in the recipe, as printed in the Nuwave cookbook, with an exception of decreasing the salt, and adding vanilla extract. The Banana Bread turned out very moist and tasty, however it took a little bit longer to bake, than originally stated in the recipe. After the original 45 minutes, it was still quite soft in the middle, so I baked it another 15 minutes on High power, and let it cool off under the dome, before taking it out. In a medium bowl, place the measured and sifted flour. Mix in the baking soda, and salt. Set aside. In a large bowl, mix the butter and sugar, until light and fluffy. Mix in mashed bananas, and vanilla extract. Add dry ingredients all at once. Stir enough to moisten the flour. Beat the egg whites, until stiff peaks form. Grease a loaf pan with Crisco shortening, and flour lightly bottom and sides of the pan. Bake on a 1" rack for 45 minutes on HI power level. Top will be browning a bit, so you may cover it loosely with foil paper. Pause and test with a toothpick. If necessary, bake another 15 minutes. Once done, let the bread rest under the dome for few minutes. Remove. Cool completely before slicing into serving pieces. I’m still trying to decide if I want to by a Nuwave oven. When you mention that it took 1hr to cook this bread I’m wondering what the difference is between this time and the regular oven cooking time. I mean, did it save any baking time? Also, did you use a regular or extra large bread pan? I guess I would not make the purchase decision of this oven based on the banana bread…but rather your need and convenience. It is great if you don’t have two regular ovens. Since you can be cooking something in the regular oven, yet make another dish in the NuWave Oven. I loved all the other recipes I tried in it. I purchased one based on seeing it work at a friend’s house. This recipe is the first time I am using it. Will see how it goes. I like that I don’t have to preheat oven. Next we are trying a pork loin and potatoes. Thank you for sharing your experience. I am looking forward to hearing from you about the success with the recipes you plan to try out. I bought mine since I was spending couple of weeks at a cottage which did not have an oven, and only 2 burner stove top…it came in handy…and I was pleased. We love our nuwave! Thanks for sharing this recipe. We weren’t sure about how long to bake our bread and you helped a lot. Our son loves cooking in it, so easy for him and he can watch the food cook. I love my Nuwave oven especially since it doesn’t heat up my kitchen in the summer like my regular oven does. The fact that my roasts don’t sit in the fat while cooking is a big plus for me since I am a diabetic with heart problems. I’ve lost weight by using it to eat healthier too. But I am going to try the banana bread recipe because I loved how my homemade biscuits turned out. That is a wonderful comment. Thank you so much. Congratulations on your healthy lifestyle, and best wishes for future success! 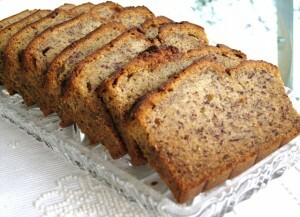 Good luck with the banana bread….please note it takes much longer to bake than the manufacturers recipe suggest….